Celebrity Hindu Chef Who Works In Dubai Posts Anti-Islam Comments. The Internet Wasn't Having It! A renowned celebrity chef in Dubai could be prosecuted after making comments on Twitter about Islam. Atul Kochhar, who runs the popular Rang Mahal restaurant in the Dubai Marriott Marquis hotel, is also facing a boycott of his restaurants and calls for him to be sacked. The row erupted after he posted a now-deleted message on Twitter on Sunday night in response to a post by Indian actress Priyanka Chopra, in which she said she was sorry that some people had been offended by the portrayal of Hindu nationalists as terrorists on her US TV show, “Quantico”. 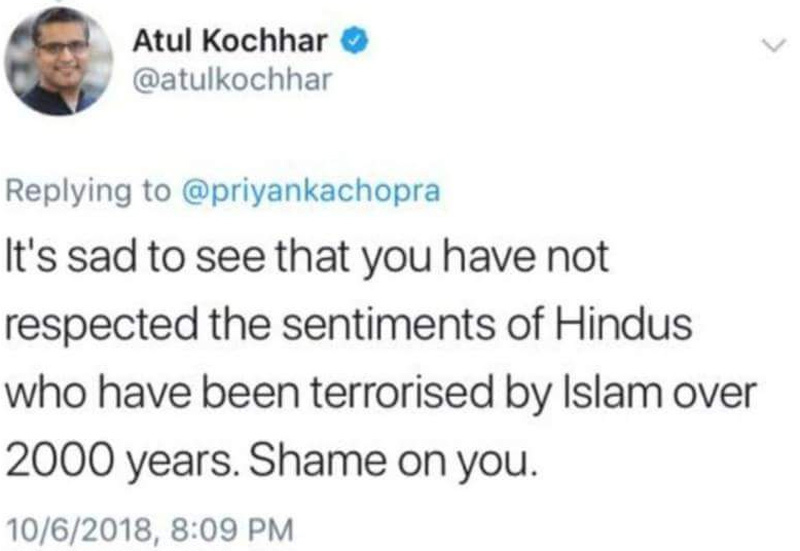 Twitter users quickly responded, criticizing Kochhar for his remarks and suggesting that he should not be working in a Muslim country if he feels badly treated by Muslims and Islam. Several people tagged Dubai police in their responses. “Dear Dubai Police, this guy earns in Dubai while (he) defames Islam by saying it is a religious of terrorism,” wrote @RoflMessi. Social media laws are very strict in the UAE. Online comments found to be spreading sectarian hate or racism, especially in connection with Islam and Muslims, are a criminal offense and the chef can be prosecuted. “The UAE’s anti-discriminatory law criminalizes all forms of discrimination on all grounds of religion, belief, sect, faith, creed, race, color, or ethnic origin,” said lawyer Yamini Rajesh, the managing director of Yamini Rajesh Legal Consultancy. She added that anyone convicted of breaking the law could face imprisonment of up to five years and a fine of between 500,000 dirhams and 1 million dirhams. Kochhar, who was born in India, is a renowned international celebrity chef, TV star and author of three best-selling cookery books. Rang Mahal is his first fine-dining Indian-cuisine restaurant in Dubai.